If you don’t understand or ‘believe in’ homeopathy, welcome. I have been in your shoes. Fortunately for me however, I have now had years of first hand and precise experience teaching me exactly how the human body responds to homeopathic remedies. Ultimately it is our senses which tell us if something is real. If we can’t see, hear, touch, taste or smell something, we question it, and if we can neither experience it with these senses nor explain it through logic, we are asked to ‘believe’ it. Mostly though, accepting something as fact neither comes from understanding nor explanation. We simply witness our senses. Here is what I mean. Do you ‘believe in’ your mobile phone, digital radio, your iPod or the internet? Do you understand how they work? And has this been satisfactorily explained? Of course not! You just know they work. Your senses tell you they do. Knowing that these things are real is not a matter of ‘belief’ or faith. It is fact according to your senses. Now here is the problem. Our health is governed at a sub-sensory level. Mostly we are unaware of our blood pressure, heart rate, liver function and so on. Fluctuations occur all the time and we are not equipped to observe them well. Our bodies respond to homeopathy at this sub-sensory level, and make appropriate adjustments to facilitate a natural recovery. Sometimes very fast. Homeopathy is a medicine of information and not one of chemical substance. This leads to another problem in scientific observation. In biochemistry, we can culture a bacterium in a petry dish, add a proposed chemical antidote and watch it die off. Homeopathy on the other hand informs our body of the bacterial invader, thereby enhancing our own immune response to often remarkable effect. This cannot be demonstrated in a glass dish. So what is homeopathy? How does it work? And is there any proof? One of the complaints raised against homeopathic preparations is that there may be no trace of the original substance in the remedy because it is so dilute. This would certainly pose a problem in the world of substance medicine, but as you will appreciate, listening to Mozart while driving down the M1 does not require a fraction of the orchestra to be jammed into your CD changer. The music, like homeopathy, is simply a recording of the original. We have learned how to record music, film and data into plastic discs and also how to retrieve it. So now the question is could nature possibly have been as ingenious as man, and created a recording medium but in water rather than plastic? And can we witness it with our senses? Over the past 20 or more years the Japanese scientist, Dr Masau Emoto has exposed water to various influences, then flash frozen it and finally thawed it under a microscope to reveal how it has responded to the influence. The breath-taking results have been published around the world, and while hundreds of scientists are now grappling with the implications, the evidence of water does indeed record, has been raised to a super sensory level. We can see it with our own eyes. I am going to touch here on an even harder thing to grasp, and that is the possibility of water (or possibly just the hydrogen element) communication with other bodies of water or hydrogen instantaneously. According to David Sereda, a Russian scientist by the name of Alexander Djefsky reported in the 1930s, that bacteria in a water suspension responded to solar flairs a full eight and a half minutes before the light of the flair reached the earth. It is now being postulated that the hydrogen in the sun may have communicated with water on earth instantaneously. The recording that produced this remarkable crystal architecture is available here. The point here is that none of this is new. Water has always behaved this way. The only new aspect is our ability to bring these changes up to a sensory level of observation. 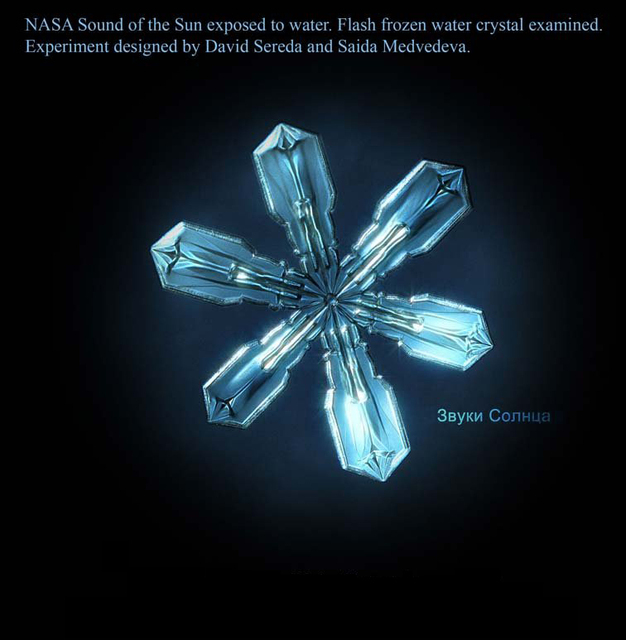 This has propelled some of the world’s most brilliant minds to engage with the mystery of water like never before. The following film: Water – The Great Mystery, documents the work, investigations and findings of scientists who have dared to enter this new arena. Luc Montagnier, recipient of the 2008 Nobel Prize for the discovery of the human immunodeficiency virus (HIV), may have scored another success, if highly controversial in the mainstream community. His research team found electromagnetic (EM) signals consistently produced in dilute solutions of the HIV virus DNA in water.